The advent of smartphones and mobile apps has brought about sweeping changes to many an industry. Healthcare is no exception. But the impact of these developments in the healthcare industry has been so staggeringthat it is practically changingthe face of the industry! The most significant outcome of thesmartphone revolution has been the opening up of new lines of communication between patients and healthcare providers. As a result of this constant two-way communication, the rapport and trust established between them have improved leaps and bounds. Many health care providers are also using mobile appsto keep track of patients for tests, follow-ups, reviews and even feedback. All this is contributing extensively towards streamlining the healthcare industry. The Power of Telemedicine Until the recent past, a visit to the doctor was mandatory to diagnose and treat any illness or ailment. That entails booking an appointment, waiting for your turn at the hospital and having a face-to-face with the physician. In these fast-paced times, people do not have the luxury to take off long hours from their regular work for even minor health issues. Also, people in remote and rural areas have to travel long distances for doctor appointments. Telemedicine solves these hassles effortlessly. Not just between patient and doctor, telemedicine is increasingly used as a collaboration and consultation tool among healthcare professionals. Doctors and physicians from around the world are now able to share and learn from each other, further improving patient care and treatment. Clinical Efficiency Another positive impact of mobile technology advancement is that doctors can work more efficiently and effectively. Information is made available to them promptly thanks to the rapid growth of smartphone technology. Use of tablets and other smart devices has made life a lot easier for medical professionals, saving a lot of time and energy spent on administrative tasks – time and energy that can be put to better use treating patients. 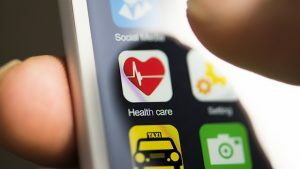 Useful Medical Mobile Apps Here are some of the many ways people are using medical mobile apps to take care of their health and fitness. #Patient Medical Information There are apps available for storing crucial medical information about the patient that may come in handy to caregivers and family members. They typically contain information such as emergency contact numbers, medications, allergies and pre-existing conditions of the patient. #Tracking of Health and Fitness Fitness tracking apps are probably the most popular healthcare apps. They keep track of your fitness activities as well as health parameters such as sleep patterns and heart rate through smartwatches, smartphones and other mobile devices. #Calorie Counting and Weight Watching Mobile apps makeit easy for people to keep track of what they are eating on a daily basis. This is a godsend for people who are trying to reduce their weight. #Managing Appointments People use medical mobile apps for keeping track of their doctor visits, reviews and health checkups. They can even book appointments with health professionals of their choice using these apps. #Medication Reminders Thesemobile appsare especially useful for patients on long-term medication to remember to take their medicines regularly and on time. Many people have lost their lives because they were unable to receive the right treatment at right time. I firmly hope that medical mobile app can help the doctors to start the right treatment to the patients during an emergency. The mobile medical app can be saving grace for both doctors and patients. Never heard about the medical mobile app and its benefits! Thanks to the author for introducing me about the innovative concept. Considering its amazing benefits, there is no reason for individuals to avoid using this technology. Media should popularize this technology and its benefits to the masses. It is very interesting to know the entry of mobile app technology into the health care industry. Seeing the benefits, I think everyone should make use of this app to minimize the possible health risk. This app can be great boon senior citizens, who are living alone. I am simply stunned to learn the concept of the medical mobile app. I think the government should create an awareness program about this app. This app can be life saving, especially during accidents. Can anybody tell me where I can download this app?